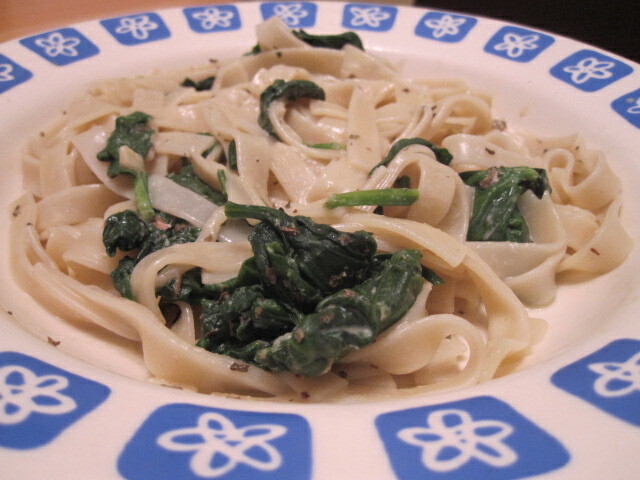 Easy Gourmet Recipes - Dairy Free Spinach Florentine Recipe. Healthy natural recipes including breakfast recipes, appetizer recipes, soup recipes, pasta recipes, holiday recipes, party recipes, dessert recipes, gluten-free recipes, raw recipes and budget recipes. 1. Boil the water and let the pasta cook while you are preparing the sauce. 2. Add the olive oil to a large skillet, add the garlic, and cook over medium heat for about 3 minutes. 3. Add the rinsed and drained spinach, and cook for another 3 minutes. Note: spinach wilts quickly. Your skillet may not be large enough to hold all 8 cups. That's fine. Put what you can in the skillet and add more as space allows. 4. Add the coconut milk and cook for another 5 minutes. Then add the rest of the ingredients and stir until well combined. 5. By the time the sauce is done, the pasta should be ready. Serve over pasta and enjoy!